It’s in Our DNA to Put Our Customer First. Always. Dr. Johannes Heidenhain’s early focus on innovation, quality and customer satisfaction was the cornerstone of its growing success and remains the keystone of its ongoing “Customer First” principle. This principle is one that we at HEIDENHAIN want to continue to bring attention to in our days ahead which is why on January 1 of this year, accelerated our Customer First efforts. At HEIDENHAIN, we’ve always known that if it wasn’t for our customers, the company would not exist. This statement embodies many things to HEIDENHAIN. 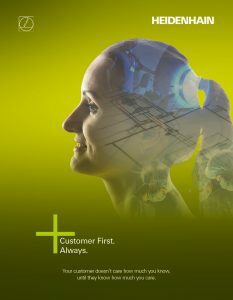 As many already know, “Customer First” is the foundation of HEIDENHAIN’s well-established research and development efforts. We know that listening requires focus and, understanding requires a concentrated effort. “Customer First” has taken us to a whole new level in providing measurement and motion control enabling technology since our beginning in 1889. HEIDENHAIN’s Customer First current campaign includes newly created internal banners, posters and a spotlight on important corporate programs. This attention includes highlighting some of those existing programs in our ongoing eNewsletters that you receive quarterly so that we may continue to share that information. A few of those HEIDENHAIN Customer First-type programs that we intend to highlight include HEIDENHAIN’s Touch Probe Rapid Repair Program and the development of HEIDENHAIN TV on YouTube, to name two. It also includes discussions of internal initiatives here at HEIDENHAIN such as an emphasis on improved training programs, better listening and communication emphases, some changes in businesses practices and escalation matters, prototype/material and sample expediting as well as organizational development. Some of those developments include the hiring of new staff in key geographic locations and creation of new significant positions. More news to come. Step two of the Customer First campaign will include an external roll-out as in advertising and other news. We look forward to sharing more news as it develops. As always, HEIDENHAIN would like to take this opportunity to thank you for your business, and your continued belief in us. We know we are in this together.